SportsBetting.ag, the sister site of BetOnline.ag, has risen through the ranks of the sportsbook industry to become one of the best options for both USA bettors and international punters alike. They have been in business since 1999, but after controversies over their slow payout timeframes in later years, they were acquired by BetOnline.ag, which oversaw a massive overhaul of their business in 2012. The website is of course very similar to that of BetOnline, but it has a much cleaner and crisp feel to it compared to BOL. In either case, SportsBetting.ag packs some serious punch for those looking to bet sports online. You can also easily access your account via your computer or notebook, as well as make quick bets on your iOS or Android-powered smartphone or tablet. They’ve really tapped into the mobile betting market as of late and this is definitely one of the more reliable places to deliver a bet on the go. 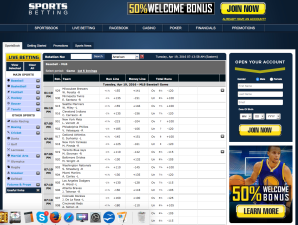 The problems that plagued SportsBetting.ag back in the day have seem to come and go, with BetOnline really making over the site – and more importantly, their brand name. 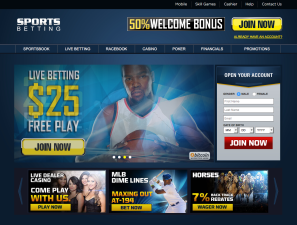 With payout issues and customer service issues fixed, this website is now one of the premier destinations for bettors. 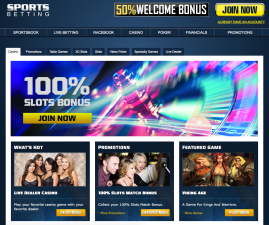 In fact, new players can earn a 50% instant bonus (up to $500) when they make their first deposit, as well as get access to several “Free Bet” promotions. They also have a full service racebook, online casino and poker room for all your gambling needs. Easy-to-clear signup bonus for new players (up to $500). Added "Free Bet" options for Mobile and Live Betting users. Reputable casino and poker site also attached. 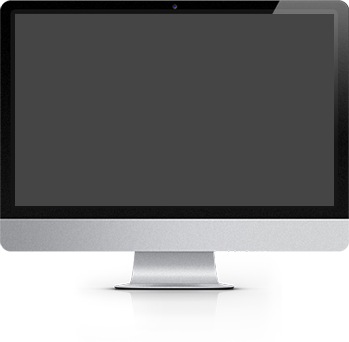 Amazing mobile platform and desktop website. 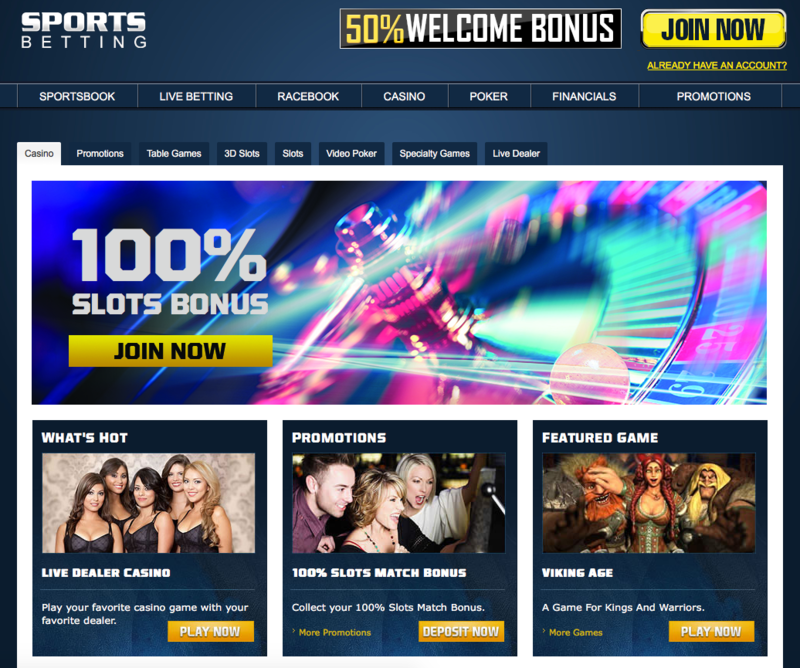 Lower bonus than that of sister site at BetOnline.ag. Rollover requirements for casino and poker a little above industry-standard. As of the writing of this review, SportsBetting.ag offers tons of different bonuses to its players, including a LIFETIME reload bonus offer. On top of that, management has also given customers a few free bets to take advantage of when you decide to take the plunge on your first live in-game wager or make a bet on your smartphone. 50% Welcome Bonus (up to $500) – It doesn’t get any simpler than this. When you enter promo code “SB50” during signup, you will get a bonus of 50% up to $500 when you make your first deposit into your account. 25% “Bonus For Life” (up to $1,000 per) – Players will earn 25% reload bonuses when you make a qualifying deposit into your account – FOR LIFE. These bonuses are immediately credited, much like the initial 50% Welcome Bonus listed above. Make sure to use promo code “FORLIFE” when you make your subsequent deposits. $25 FREE Live In-Game Bet – Check out SportsBetting.ag’s amazing new In-Game betting platform, select a single game (and your preferred bet) and make your $25 wager. If the game loses, email support and you’ll get that $25 credited back to your account – no harm, no foul. $50 FREE Mobile Bet – Just like the in-game free bet you’ll receive, players who make a $50 wager straight from their smartphone’s web browser will qualify for an immediate $50 credit back to their account should your bet lose. Simply email support and let them know if your bet loses so they can send the money back right away. SportsBetting.ag offers competitive lines for all major sports, including the NFL, NBA, MLB and NHL. Like BetOnline, the total amount of sports they offer lines for currently stands at 17 different sports. Using their backend, you can also filter out separate leagues and events for each sports, such as Euro PGA events, Japanese baseball league games and WTA/ATP matches for tennis. The most popular betting markets for Americans is undoubtedly anything football-related. From NFL to NCAA action, SportsBetting.ag offers competitive pricing and also offers decent lines for spread bets and 2-team parlays. The site is definitely geared towards American players, but management has never shied away from posting lines for even the most popular international sports as well. Other often-bet sports include NBA, MLB and NHL, with Futures bets on the “Big 4” accounting for a ton of action year-round from US bettors. Sports like golf, tennis and soccer are also quite popular for those living stateside. When it comes to punters around the world, especially those in Europe, Asia and Australia, the most popular sporting events to wager on involve international soccer, which SportsBetting.ag offers dozens of country options and betting lines for UEFA, CONMEBOL and more. Other major sports that international punters enjoy placing wagers on include football, baseball, basketball, hockey, golf, tennis, boxing and cricket matches. You can access ALL the sports offered here by checking out this page: https://www.sportsbetting.ag/sportsbook. 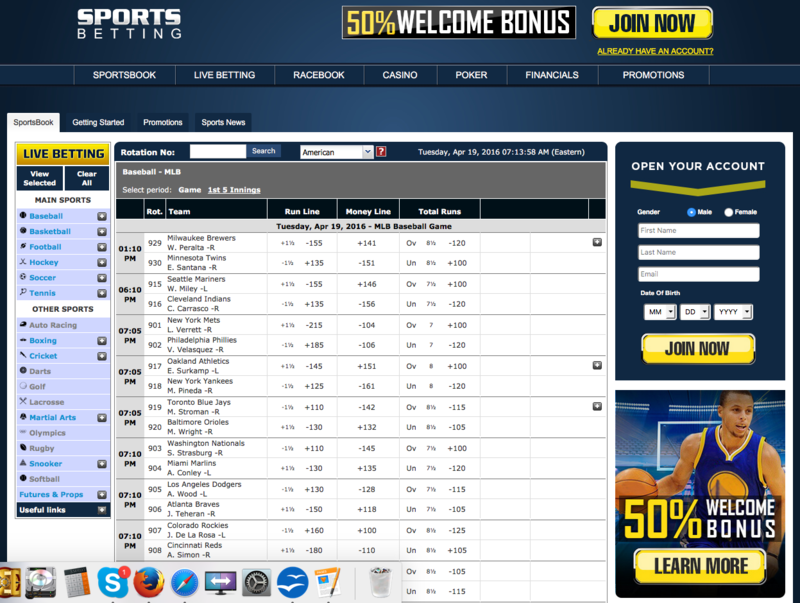 SportsBetting.ag has all types of bets covered when it comes to their platform and live lines. These betting options of course include spread bets, moneyline bets, total (O/U), props and futures. Since they share their technology with BOL, users get immediate access to some of the fastest line postings anywhere. These “overnight lines” sometimes get put up a full day before games in major sports leagues, as well as NFL lines that are available almost immediately after the week’s schedule finishes up on Monday Night Football. As I mentioned in my review of BetOnline.ag, this is of course a personal favorite of mine when it comes to sportsbooks. The look and layout of the site, as well as the ease of navigating all the games and lines, make this a no-brainer recommendation for those looking for some great lines on their favorite teams and players. SportsBetting.ag also offers players solid “dime lines” for MLB games, including DL’s that go all the way up to -194! There are also reduced juice bets available for those wagering on NHL games, which include 10-cent lines for your action. These types of lines are great incentives to sign up today – who doesn’t like free money again? As far as standard odds go, SportsBetting.ag isn’t uber-competitive for most sports. For example, most NFL lines will have normal -110 pricing, along with a bunch of similar lines you would easily get at other books for other sports leagues. 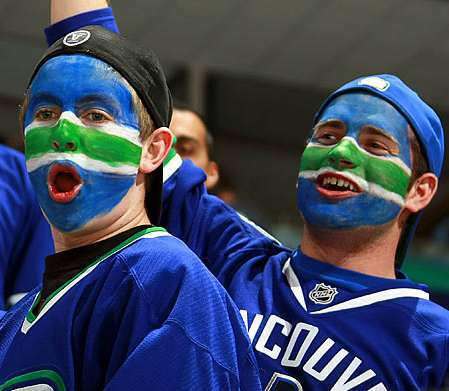 You have to navigate around a little bit, but unless you’re scooping up those dime lines or reduced juice bets for MLB and NHL, you’re going to be hard pressed in finding lines that will most likely be found at other online bookies as well. Betting limits can vary a lot depending on the sport, but they’re of course the same as those offered over at BetOnline. 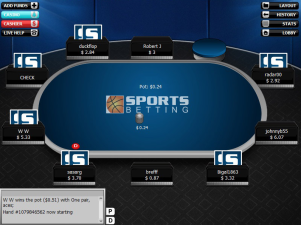 The site caters to players with all sorts of bankrolls, but you will come to see they’re not exactly looking to compete with other bigger books when it comes to their max bet sizes. For most of the major sports, including NCAA action, these games are normally capped at $500 for props and anywhere from $1,000 to $10,000 on moneyline bets. For those primarily betting a lot during football season, NFL games at capped at $25,000 sides and $15,000 sides for NCAA games. There are a lot of different ways you can fund your account at SportsBetting.ag, including using popular methods like Bitcoin, Visa/MC and Skrill. This review will break down the best options for both USA players and international punters. If you need ANY help depositing or just have questions regarding your account you can email customer support at [email protected] and they’ll get you taken care of right away. It is recommended you email or call at 1-888-843-9027 if there are any issues you experience when attempting to fund your account. At the time of this writing, SB.ag offers 13 different deposit options for bettors. Basically, this site has you covered if you’re looking to bankroll your account quickly and without any hassle. The “usual suspects” are of course accepted, which include Visa/MasterCard, Skrill, Bank Wire and a few more that we’ll list below. Right now, there are 7 methods players can utilize for withdrawals. Depending on what method you select, you could expect to receive your funds in a matter of hours to at most 30 business days. Check out the full list below. SportsBetting.ag packs one of the most intuitive mobile betting software around. While they lack an actual app like other sites like Bet365 have, the site more than makes up for it with one of the best and easily navigable mobile platforms in the business today. The software you can access straight from your phone is very fast and lines are available in real-time 24/7. All you need is a iOS or Android-friendly device – it is as simple as that. Your account information and bankroll is accessible at all times and your data is 100% secure, even from your iPhone, Galaxy, iPad or any other smartphone or tablet. It is hands-down one of the nicest mobile backends I’ve ever had the pleasure of using. And don’t forget, ALL new accounts are eligible for a FREE $50 bet when you access and make your wager straight from your mobile device! If you win your match, congrats on the $50 score; however, even if you LOSE you still WIN. Just email support and let them know about the mobile bet promotion and they will credit that $50 loss right back to your account.